Sodium chloride is obtained through mining or derived from the sea or salt lakes and is commonly used for cooking or as deicing salt for roads. The sodium chloride content of sea water is around 2.7 M.%. Sodium chloride can enter buildings or monuments when these are in contact with materials containing this salt or even other salts containing either sodium or chloride, that might combine to produce NaCl in or efflorescence on them. Contamination with sodium and chloride ions can also occur through contact with salt laden ground or surface water. A range of cleaning materials (e.g., acidic and alkaline cleaners or combination of them), or previously used restoration materials (e.g., water glass) as well as Portland cement, can introduce sodium and chloride ions into monuments. Further common and important sources are deicing salts and maritime environments where the air and fogs may contain a significant amount of sodium chloride in suspension or dissolved in droplets. The commonly occurring halite has a solubility of 6.13 mol/kg (20°C) and can be considered as a very soluble and, therefore, easily mobilized salt. Its solubility changes not significantly within a temperature range of 10 -30°C. Figure 1: Solubility of sodium chloride in water. The molality m [n(NaCl)•kg(H2O)-1] is plotted versus the temperature. Figure 2: Deliquescence behaviour of sodium chloride. The water activity aw is plotted versus the temperature. Halite has a deliquescence humidity of about 75% RH, therefore it tends to pick up moisture easily in most temperate climates. 75.9%r.h. 75.6%r.h. 75.4%r.h. 75.2%r.h. 75.2%r.h. 74.8%r.h. Table 3:Moisture sorption in M% after 56 days according to [''Vogt.etal:1993'']The entry doesn't exist yet. 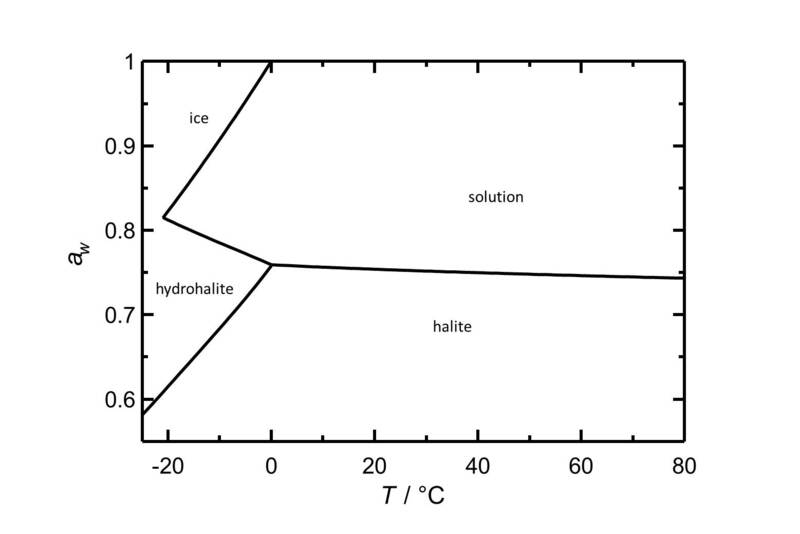 Under normal environmental conditions only halite will crystallize out of a saturated solution. 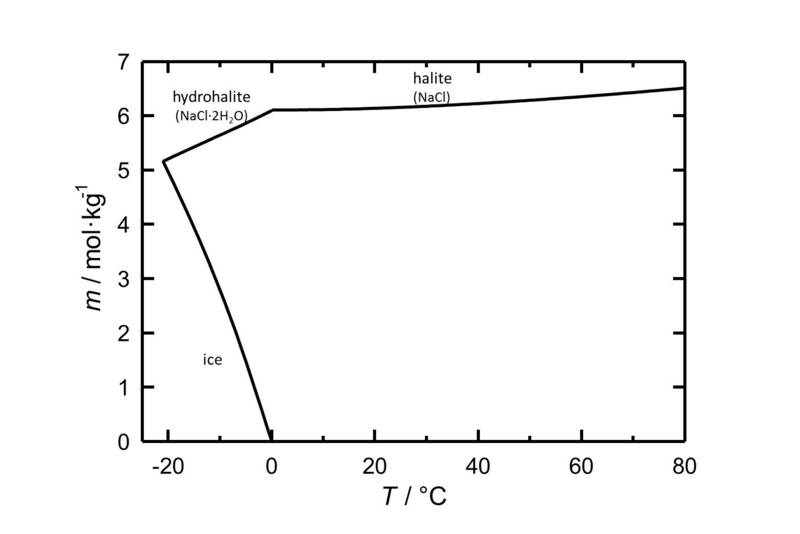 The hydrated form, dihydrate hydrohalite will only precipitate out at temperatures below 0.15°C. 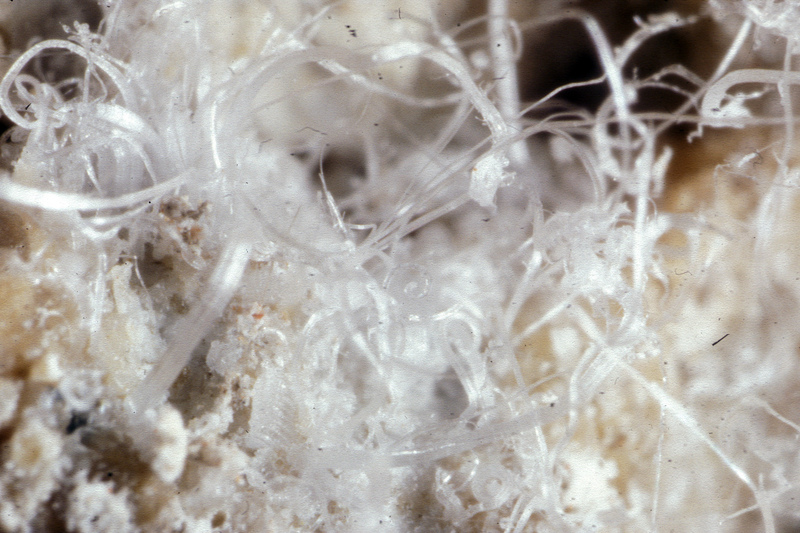 Sodium chloride crystals can be reliably identified on the basis of their morphological features. Individual particles usually form cubic or octahedral shapes and, therefore, clearly display right angles in their crystal construction. 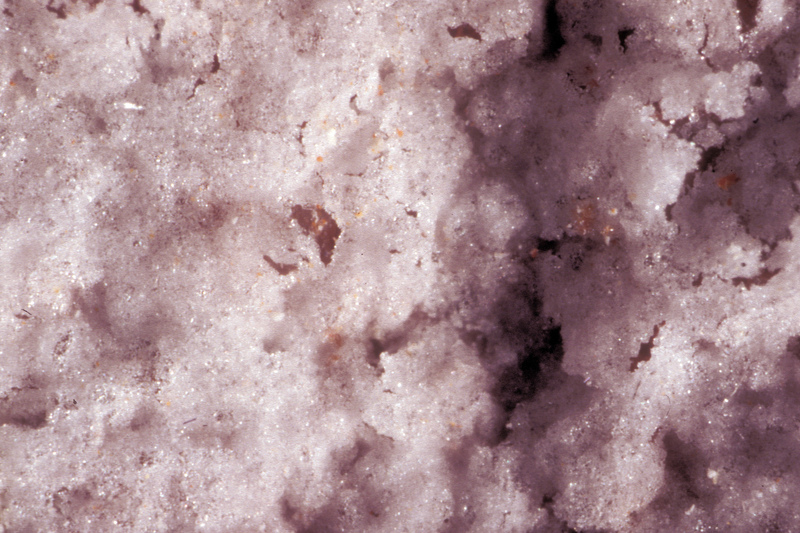 There are few salts belonging to the cubic crystal system which can be found in masonry, i.e., sodium chloride (halite), potassium chloride (sylvite) and calcium fluoride (flourite). Only the two first salts are highly soluble and therefore they are the ones that can cause damage to the masonry. Because of its isotropic internal structure these salts do not display birefringence. The refractive index can be measured with the immersion method by using a standard oil with a refractive index of nD =1.518. Halite crystals display the same optical density in every direction so that the speed and orientation of linear polarized light waves are not distorted, therefore, when viewed between crossed polars, the crystals are not visible, i.e., they show "extinction". The three above mentioned isotropic salts can be easily differentiated. Sylvine KCl Refractive index below 1,518. Fluorite CaF2 Refractive index below 1,518, barely water soluble. NaCl whisker growing on brick from a church in Venice. The sample had been kept in a film cartridge so it dried out very slowly. 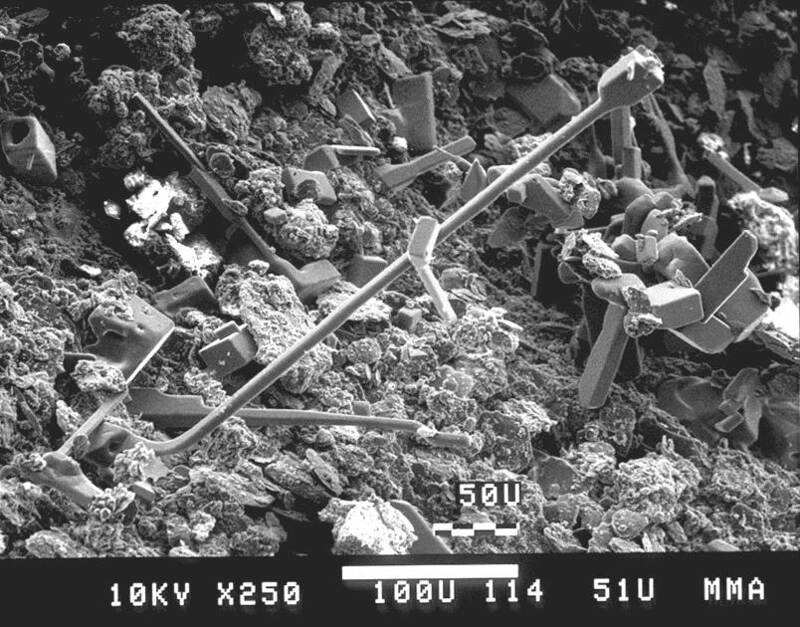 A nice cubic crystal can be seen at the tip of the whisker that had been on the surface of the brick as efflorescence when the sample was taken. [Steiger] The entry doesn't exist yet.